My negative answer elicited some disappointment, but after I explained that I was part of a group of artists with no funding, simply hoping to draw attention to homelessness in Seattle, someone raised his hand. 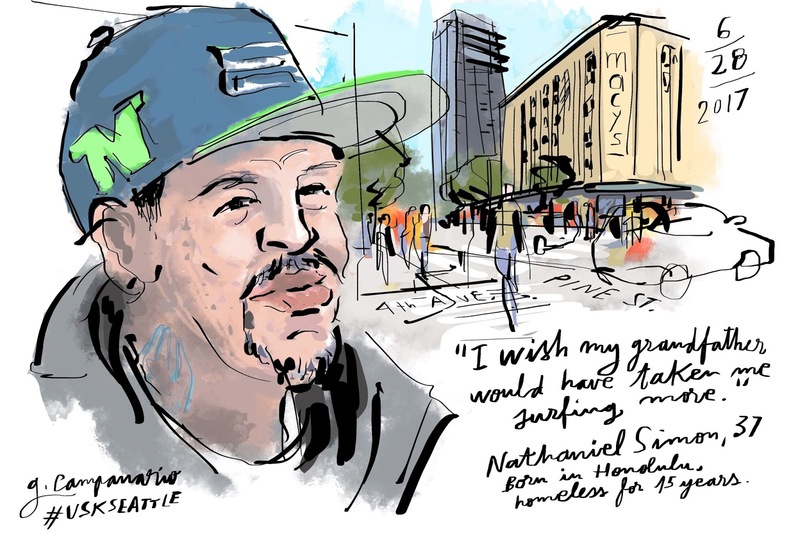 "I'm very homeless," said Nathaniel Simon, a 37-year-old Seahawks fan who likes to greet people with an elbow bump. Simon, who has been homeless for 15 years, traced the root of his situation to run-ins with the law when he was growing up in Honolulu. He said he first got in trouble for stealing mopeds. Later in life, adversities piled up. He said he got shot in Las Vegas, suffered from drug addition and is currently battling throat cancer.